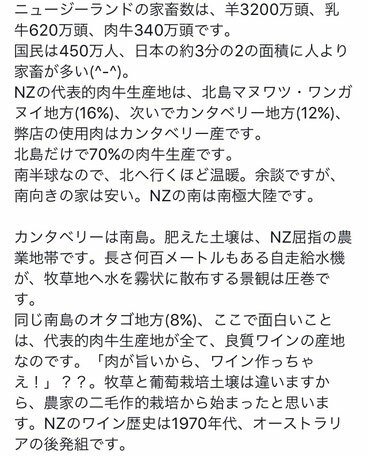 ニュージーランドの牛肉とは？　What's New Zealand Beef ? 飼育ホルモンてなあに？　What are hormone growth promotants ? 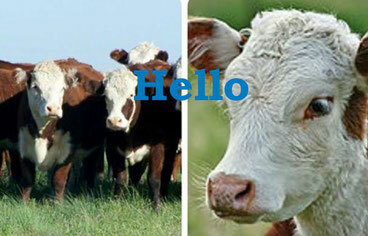 A number of livestock in New Zealand is 32 million sheep, 6.2 million dairy cows, 3.4 million beef cattle. New Zealand has a population of 4.5 million and the whole area of land is two to three of Japan. So more number of livestock are living than people. Main beef cattle production centers in New Zealand are Manawatu-Wanganui Region 16% in the North Island and Canterbury Region 12% in the South Island. 70% of meats are produced in the north Island. Grill-Teru Restaurant's meats are made in Canterbury. As an aside, a house which faces south is a lower price than north because New Zealand locates in a southern hemisphere, a south of New Zealand is the Antarctic continent. The Canterbury located in the south island and it's a foremost agricultural zone with its rich soil. You will wonder to look at an automatic self propelled sprinkler which are sprinkling water into a pasture. In a same south island, Otago region which owed 8% of a meat production, is also one of good wine production centers as same as other meat production centers. " Meat tastes good! Let's produce Wine too," may be they say?? But there is a deference between a soil for Wine and for Cattle Pasture, so it seems to begin by a double cropping. NZ Wine history is since 1970s and behind in Australia. Especially, at Central Otago in the Otago Region, a famous wine Pinot Noir is produced. In a recent year, we have some concern that its reputation grows up and its price is rising up as 2006's was special and 2012's and 2015's were good years. Sauvignon Blanc made in Wangnui or Marlborough, mainly expanded the name of NZ Wine world wide. NOBILO is my favorite wine due to its smell of fruits as Mango and Passion Fruit and its dry taste. Those tastes brought me into NZ Wine world. At the last month, I saw a crop of Sauvignon Blanc in a winery at Waiheki Island. In this year, a cold summer influenced a corp and we worry a eveluation for 2017 NZ Wine. Those wines (in a picture) are serving in our another restaurant "SABOU" located at Toranomon Sanou in Tokyo. 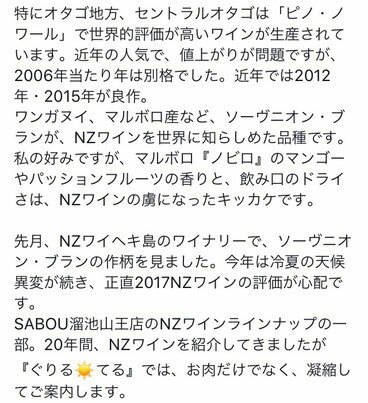 We serve NZ Wines for 20 years, Also,we will serve selected NZ Wines with NZ Beef in our New Restaurant "Grill-Teru."